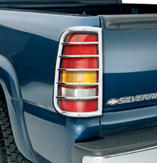 For a complete finished look, just add Westin's rugged Tail Light Guards to your truck or SUV. Available in two finishes; Chrome plated 304 stainless steel tubing for maximum rust protection and black powdercoat made from hot rolled carbon steel tubing. Westin Tail Light Guards are carefully sanded to achieve the smoothest possible finish and welds. They offer maximum protection and are a perfect complement to your vehicle.